This anonymous Gujarati text of the 'Svetambara' Jain canon is written in Jain 'nagari' script. The manuscript is dated Vikram Samvat 1734, or 1677 AD in the Western Calendar. 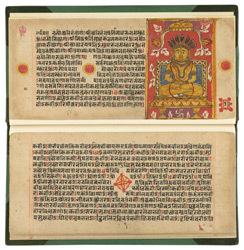 It's an interesting example of a manuscript in which the Prakrit Avashyakasutra text is followed by its Gujarati commentary, making this crucial religious book accessible to all followers of the Jain religion. This is important because the Avashyakas are the essential duties that all Jains must perform daily.